Sony PlayStation Game published 23 years ago by Asmik Ace Ent. Virtual Pro Wrestling © 1996 Asmik Ace Ent. Take your pick from one of 52 wrestlers and tackle the different divisions in the League Challenge. Or play the Best of Seven, where you can win a championship you name and wager with friends. Exhibition matches against a friend or the computer are also possible. There is also the 5-on-5 elimination match, with two rule sets. A Tournament and League mode with up to eight participants. And the Double Title mode, where you and a friend compete for the titles found in the memory cards. Each wrestler is equipped with over 30 to 40 moves. Released in Japan in September 13, 1996. This is the first game developed by The Man Breeze, who would later become AKI Corporation and is today known as syn Sophia, Inc. In 1995, Syuji Yoshida became the director of Fire Pro Wrestling: Iron Slam '96, the first Fire Pro videogame in full 3D. When not met with the success he wanted, and growing frustrated over HUMAN's lack of support to develop further 3D Fire Pro videogames, Yoshida left the company, taking character designer SHINSUKU, planning director GETA-SAN and program designer and developer SHIKA to form The Man Breeze, which was a company initially planning on developing wrestling games, and together, they started forming an engine that would enable pro wrestling action in full 3D. 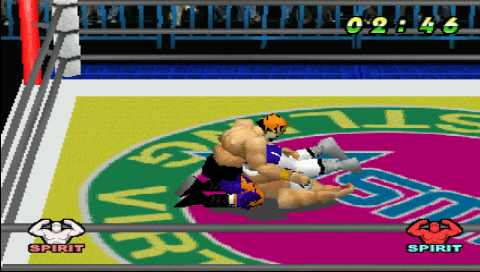 To unlock a wrestler based on Tiger Mask, you must complete each of the League Challenge promotions using the same Junior Heavyweight (cruiserweight) wrestler each time to unlock a new Super Jr. course. Complete this course to unlock the new wrestler. To unlock a wrestler based on Andre The Giant, you must complete each of the League Challenge promotions using the same Heavyweight wrestler each time to unlock a new Super Heavy course. Complete this course to unlock the new wrestler.